Is Suncor Energy Inc. (NYSE:SU) A Good Stock To Buy? The latest 13F reporting period has come and gone, and Insider Monkey is again at the forefront when it comes to making use of this gold mine of data. We have processed the filings of the more than 700 world-class investment firms that we track and now have access to the collective wisdom contained in these filings, which are based on their December 31 holdings, data that is available nowhere else. Should you consider Suncor Energy Inc. (NYSE:SU) for your portfolio? We’ll look to this invaluable collective wisdom for the answer. Suncor Energy Inc. (NYSE:SU) has experienced a decrease in hedge fund sentiment lately. 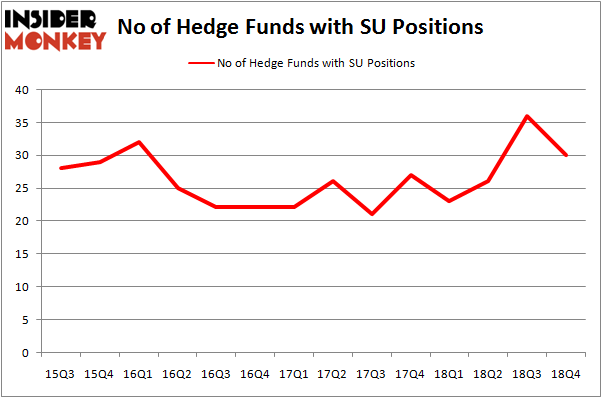 Our calculations also showed that SU isn’t among the 30 most popular stocks among hedge funds. We’re going to take a glance at the latest hedge fund action regarding Suncor Energy Inc. (NYSE:SU). What does the smart money think about Suncor Energy Inc. (NYSE:SU)? At Q4’s end, a total of 30 of the hedge funds tracked by Insider Monkey held long positions in this stock, a change of -17% from one quarter earlier. By comparison, 23 hedge funds held shares or bullish call options in SU a year ago. So, let’s see which hedge funds were among the top holders of the stock and which hedge funds were making big moves. 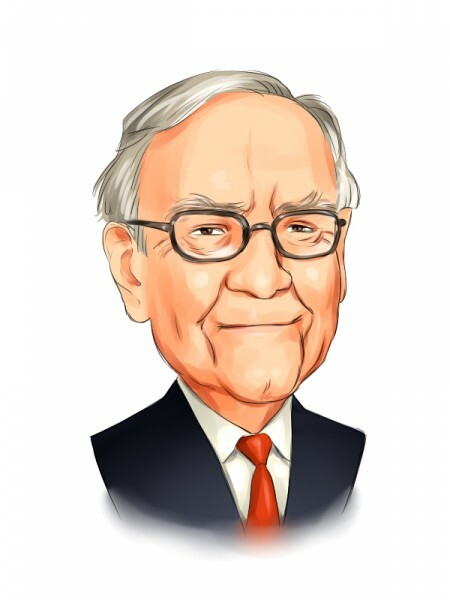 Of the funds tracked by Insider Monkey, Berkshire Hathaway, managed by Warren Buffett, holds the largest position in Suncor Energy Inc. (NYSE:SU). Berkshire Hathaway has a $300.9 million position in the stock, comprising 0.2% of its 13F portfolio. On Berkshire Hathaway’s heels is Jim Simons of Renaissance Technologies, with a $112.2 million position; 0.1% of its 13F portfolio is allocated to the company. Some other members of the smart money that hold long positions consist of Cliff Asness’s AQR Capital Management, Ken Griffin’s Citadel Investment Group and Kelly Hampaul’s Everett Capital Advisors. Since Suncor Energy Inc. (NYSE:SU) has witnessed a decline in interest from hedge fund managers, it’s easy to see that there lies a certain “tier” of fund managers who were dropping their full holdings last quarter. It’s worth mentioning that Zach Schreiber’s Point State Capital sold off the biggest investment of all the hedgies followed by Insider Monkey, comprising an estimated $130.9 million in stock, and Josh Donfeld and David Rogers’s Castle Hook Partners was right behind this move, as the fund said goodbye to about $74.1 million worth. These moves are interesting, as aggregate hedge fund interest was cut by 6 funds last quarter. Let’s check out hedge fund activity in other stocks similar to Suncor Energy Inc. (NYSE:SU). These stocks are Illumina, Inc. (NASDAQ:ILMN), Telefonica S.A. (NYSE:TEF), Raytheon Company (NYSE:RTN), and Exelon Corporation (NYSE:EXC). This group of stocks’ market values are similar to SU’s market value. As you can see these stocks had an average of 30.25 hedge funds with bullish positions and the average amount invested in these stocks was $1200 million. That figure was $1055 million in SU’s case. Illumina, Inc. (NASDAQ:ILMN) is the most popular stock in this table. On the other hand Telefonica S.A. (NYSE:TEF) is the least popular one with only 6 bullish hedge fund positions. Suncor Energy Inc. (NYSE:SU) is not the least popular stock in this group but hedge fund interest is still below average. Our calculations showed that top 15 most popular stocks among hedge funds returned 19.7% through March 15th and outperformed the S&P 500 ETF (SPY) by 6.6 percentage points. Hedge funds were also right about betting on SU as the stock returned 21.8% and outperformed the market as well. Do Hedge Funds Love Diageo plc (DEO)? Itau Unibanco Holding SA (ITUB): Are Hedge Funds Right About This Stock? Were Hedge Funds Right About Buying Costco Wholesale Corporation (COST)? Were Hedge Funds Right About Buying United Technologies Corporation (UTX)? Hedge Funds Have Never Been This Bullish On Thermo Fisher Scientific Inc. (... Were Hedge Funds Right About Dumping Twenty-First Century Fox Inc (FOX)?